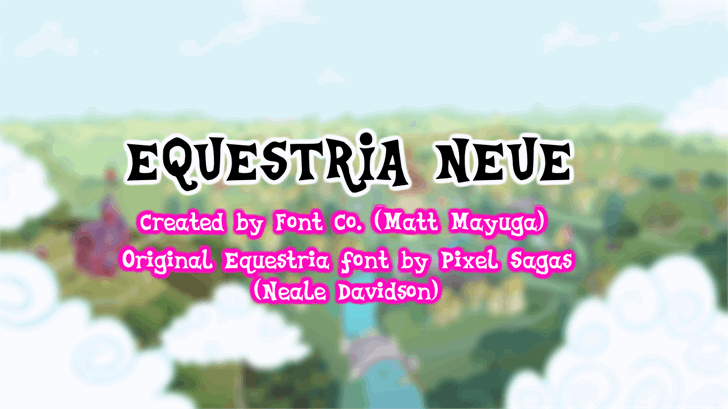 Equestria is the most popular My Little Pony font created by Neale Davidson. Equestria Neue aspires to be the better version of Neale Davidson's Equestria font. It's perfect as a font for some My Little Pony stuff, for making MLP logos, and more. Includes full alphabet (both upper-case and lower-case), more extended characters and punctuation, and Euro. New symbols are also added in this font.